Marketing automation is gaining wide adoption as a standard technology used by sales and marketing teams of all sizes. A sea change in how B2B buyers buy and marketers market requires a new look at techniques to better align sales and marketing teams, gain control over marketing programs, measure marketing effectiveness, and strengthen the sales pipeline. In a series of three posts we’ll share feedback from other senior-level marketers on why there is a need for marketing automation, benefits of marketing automation, and highlight their lessons learned from using marketing automation. This post covers the need for marketing automation. Before diving into the data, let’s first clarify some definitions. 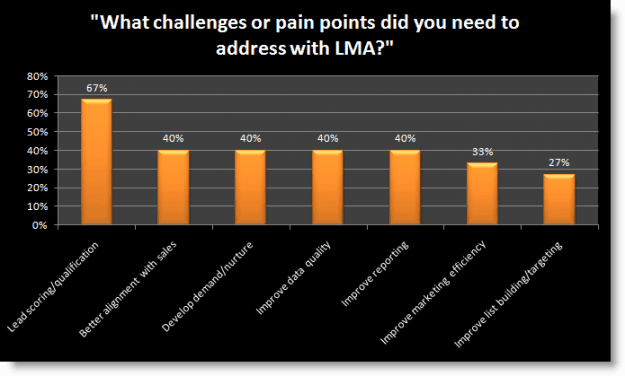 LMA stands for “Lead Management Automation”, which is an industry name for technology in the marketing automation space. At Lead Liaison we believe marketing automation is a feature of an overall solution. We use this feature to deliver a wide array of benefits as part of our revenue generation software (the solution). 1. The top two pain points revolve around how sales and marketing interface. To improve collaboration between sales and marketing teams start by creating a Service Level Agreement (SLA) then procure a marketing automation software solution. A SLA is an agreement between sales and marketing which defines how the two teams work together to leverage marketing automation technology. It’s a blueprint for success. 2. The number one problem is lead qualification. Marketing automation delivers lead scoring, which is an automated way to objectively qualify leads using technology. Without this technology the definition of a lead is purely subjective and will vary between sales and marketing. Define the universal definition of a lead in the SLA and use lead scoring to establish a point system for qualifying a lead against your criteria and lead definition. Lead scoring will assign points based on a leads activity and demographics to score the lead until they are qualified and ready for sales. We welcome your feedback, comments and suggestions. What is your need for marketing automation? To be alerted of future posts, please click on the RSS button. Feel free to read part two, benefits of marketing automation, and part three, lessons learned from marketing automation.